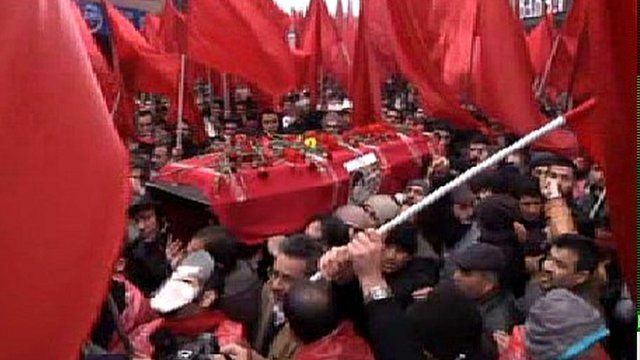 Grief as Turkish boy dies in coma Jump to media player There has been a huge outpouring of grief and anger in Turkey over the death of a teenage boy who was wounded in last year's anti-government demonstrations. Clashes over Turkey internet law Jump to media player Riot police in Turkey have used tear gas to disperse thousands of people in Istanbul protesting against a new national law that tightens control of the internet. 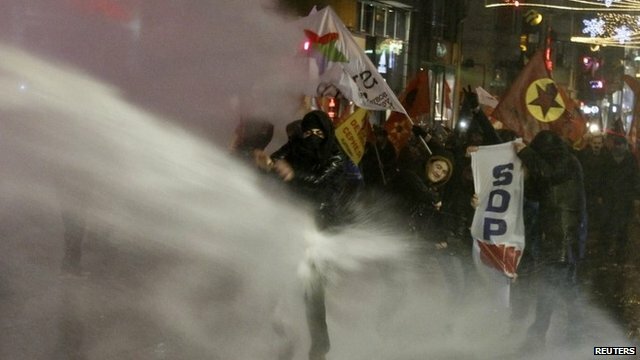 Fireworks thrown at Turkey rally Jump to media player Turkish riot police have fired water cannon and tear gas at hundreds of demonstrators marching in Istanbul in protest at new laws tightening government control of the internet. There has been a huge outpouring of grief and anger in Turkey over the death of a teenage boy who was wounded in last year's anti-government demonstrations. Berkin Elvan, 15, was hit on the head by a tear-gas canister in Istanbul while on his way to buy bread in June. He had been in a coma ever since. Clashes erupted at the hospital where he was being treated and there was an outpouring of emotion as his coffin was carried through the city streets.